Did you know that Olioboard sponsors fun design challenges where you create an olioboard based on a theme and/or product? If you like creating mood boards, you should definitely check it out. This week I decided to take part in their Home Office Design Challenge and I created a trendy, girly, workspace for deux. 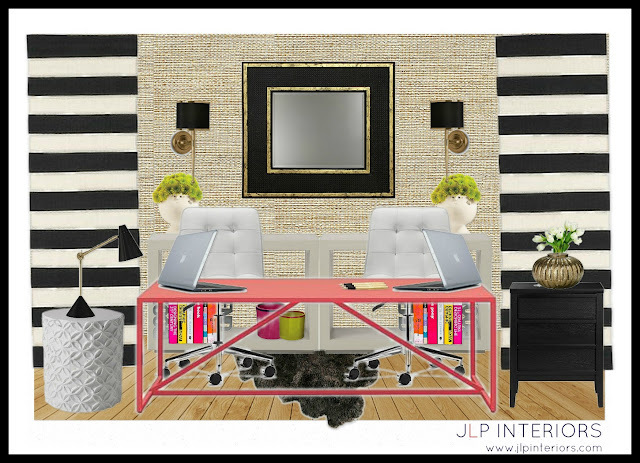 I am in love with the desk, the sconces, the mirror, and those black and white stripes! I wanted to design a space that was sophisticated and stylish but with a punch of fun. I love incorporating a pop of bright color into my designs. For a complete source list, follow me on Olioboard under homewithbaxter. Of course, I'd love your votes in the design challenge too. You can vote here. 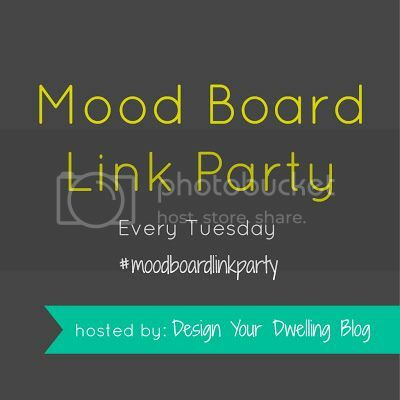 I'm also partying over at Design Your Dwelling for her weekly mood board link party. Grab your mood boards and head on over! I LOVE this office! It's the perfect mix of colors with just enough simplicity! Love it Jessica! I am really loving black and white with pops of color these days so this is perfect. Makes me want to redo my office area. :) Thanks for sharing. I like this! The pink desk is great! I'm so used to seeing dark wood or white ones, this is a nice change! Never would have thought of it. Love the textured wall! Thanks for linking up! Thanks Renee! Thanks for hosting! Cute! I voted for you. I have never entered any challenges, but I do enjoy making mood boards sometimes ;) Thanks for sharing and good luck! Very nice and classy! Love the pink desk!